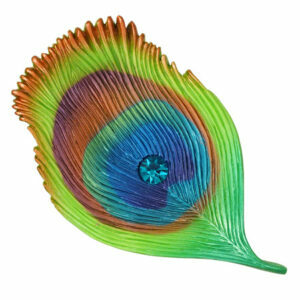 We’ve always liked our colorful Peacock design, so we focused on just a single feather. Plus, we’ve been seeing a lot of peacock feathers in the fashion market and decorative arts. The feather is airbrushed with a rainbow of iridescent paint, and its centerpiece is a large Swarovski jewel, about 3/8″ in diameter.